Why Should Your Facility Have Online Health Research? More patients are relying on themselves to properly manage their healthcare. While they should seek a physician for proper care, the fact remains that patients are seeking information about their health online. The Internet is providing information that before was difficult to get. Now patients, their families, and friends are empowered to search and learn about health issues. This transition in the flow of information to patients can be used to the advantage of hospitals, clinics, and their affiliated physicians. Unless a hospital has a strategy for getting community patients to the local hospital website they risk losing business to hospitals and clinics that are more in tune with changes in healthcare. FastHealth Provides the most comprehensive research experience by allowing hospitals to sponsor a local healthcare research engine. Research Engines are the most visited websites on the Internet. Combining healthcare with a search approach insures an infinite research experience. This experience allows patients to explore and return with much frequency, which in turn insures higher patient loyalty and access to your physicians. 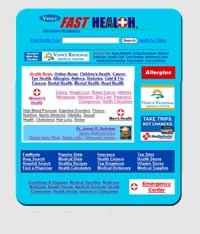 FastHealth provides a service that allows customized research to be undertaken from your website. Physicians, employees, and even patients can ask for research to be completed though your FastHealth programming. The FastNurse Research CorrespondentTM service is unique to FastHealth and adds to the value of online health services for your local community.